OLGA GRUSHIN is the author of the novels, The Dream Life of Sukhanov and The Line (published as The Concert Ticket in the UK), as well as stories, literary criticism, essays and other works. Born in Moscow in 1971, the daughter of the prominent Soviet sociologist Boris Grushin, she spent a large part of her childhood in Prague. After returning to Moscow, she studied art history at the Pushkin Museum of Fine Arts and journalism at the Moscow State University. Growing up in Moscow, she read many classics in translation: A.A. Milne’s Winnie-the-Pooh, Hans Christian Andersen, Astrid Lindgren, Tove Jansson’s Moomin books, and Lewis Carroll’s Alice’s Adventures in Wonderland and Through the Looking-Glass. After moving to Prague, she discovered a local library overflowing with books she had never heard of in Russia. She brought piles of them home, devoured them greedily, and went back for more. Later, when she was ten or eleven, she began to read everything she could find on her parents’ bookshelves in Moscow: Poe, Twain, Dumas, James Fennimore Cooper, Verne, Kipling, Stevenson, and so on. She tackled the Russian classics at thirteen or fourteen, devouring everything by Gogol, Dostoyevsky, Tolstoy and Chekhov, and a year or two later she discovered the Russian poets—Anna Akhmatova, Marina Tsvetaeva, Nikolai Gumilev and Osip Mandelstam. After returning to Moscow, she studied art history at the Pushkin Museum of Fine Arts and journalism at the Moscow State University. Writing in English, she says, is a world of difference from writing in her mother tongue. “The languages are so different that my style in English is inevitably different from my style in Russian, just as my thinking is different in each language: each comes with its own intellectual and emotional vocabulary.” Russian is the more emotional and lyrical of the two, and English, while somewhat drier, has a richer vocabulary and, therefore, the capacity for profound nuances and precision. “English is now my official writing language while Russian is my private language, reserved for my diary and letters to my family.” But she does try to imbue the English of her fiction with a Russian sensibility: since her novels are set in Russia, she has attempted to retain Russian cadences in her sentences and use Russian turns of phrase. Some, like her father and the artist Ernest Neizvestny, a close family friend, followed their beliefs and suffered the consequences. (Neizvestny, one of the artists exhibited at the infamous Manège show in 1962, stood up to Khrushchev in a celebrated confrontation and was eventually forced to emigrate to the US.) Others bargained with the authorities and enjoyed certain rewards, but always at a price. The questions of artistic courage and betrayal, daily comfort and immortality were very real concerns from her earliest years, and Sukhanov was the result of her thinking about these questions for a long time. For a while she also debated between making him an artist or a writer, but an artist seemed the more interesting choice: “For one thing, I wanted to imagine someone more remote from myself; for another, I liked the challenge of writing a very visual novel: everything in the novel is seen through Sukhanov’s eyes, through the eyes of an artist of genius who has ignored his talent for years, yet who cannot help but perceive reality as an artist would, in vivid colours, with striking images, even with scattered, hidden references to actual masterpieces throughout.” And the surrealism motif, which passes through the novel, ties in perfectly with her exploration of madness brought on by the denial of one’s true nature. 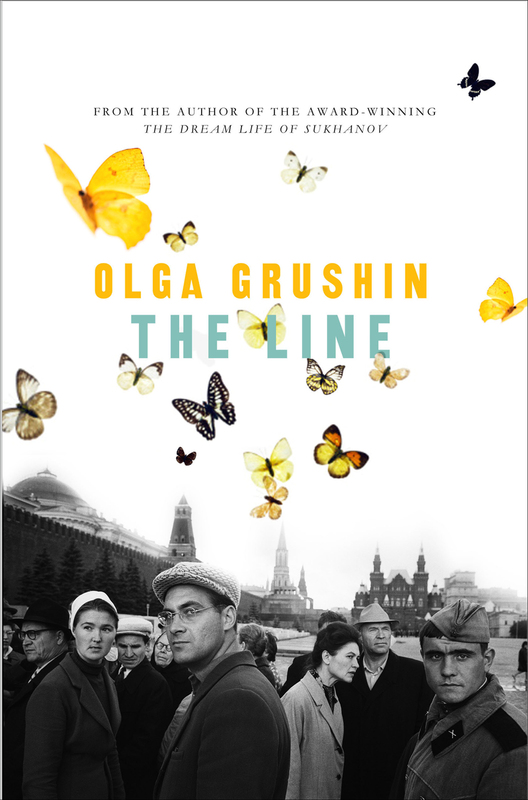 Grushin’s second novel, The Line, also published as The Concert Ticket, was inspired by a real historical event. In 1962, the celebrated Russian composer Igor Fyodorovich Stravinsky was invited to visit Russia after nearly fifty years of exile to perform his music at a Leningrad concert hall. When people learned about it, they lined up for tickets, and the line lasted an entire year, evolving over time into a unique and complex social system, with people working together and taking turns standing in line. The story of the year-long waiting in line struck her as incredibly powerful, but it took her only a day or two of research to realise that she would not be using the actual event at all, as it developed in ways different from the direction she intended to go with the book. She did, however, listen to a lot of Stravinsky and read accounts of the Ballets Russes, a Russian ballet company that was a sensation in Paris in the years before the Revolution, which inspired another development in her novel. “That said, The Line required no research per se, and is very far from being a historical novel: it takes place in the unnamed capital of an unnamed country and its temporal setting is an amalgamation: I borrow liberally from three different periods of Soviet history, namely, the repression of Stalin’s 1930s, the hopefulness of Khrushchev’s Thaw (late 1950s to early 1960s) and the stagnation of Brezhnev’s 1970s.” She imagined the book not so much as a story set in Soviet Russia but rather as a Russian dreamscape of sorts—a meditation on hope, history and time.